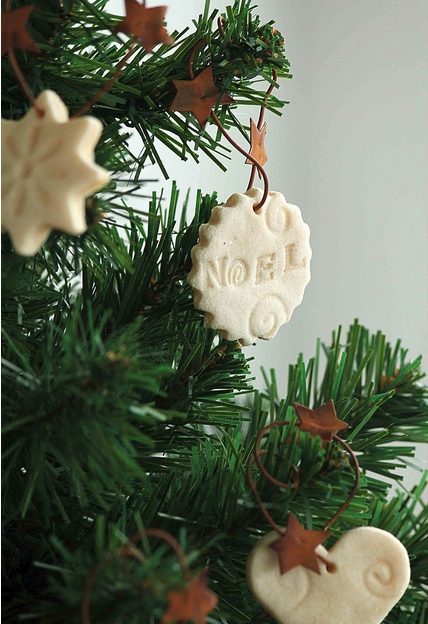 Adorable DIY dough ornaments for kids and adults alike! Cut into desired shapes and make holes for hanging. Imprint designs like swirls, lines, or words using stamps or your creative hand! Bake for 30 minutes; allow to cool. Decorate with poster paints or tube paints (or keep simple as shown in photo). Allow to dry and spray with clear polyurethane on both sides to preserve. Use ribbon or twisting metal wire to hang. You can also mix acrylic paint into the dough. Just reduce the water in the mix accordingly. I've made bears and bunny angels. Use a paper clip to make impressions on the wings. I antique them using thinned brown paint.